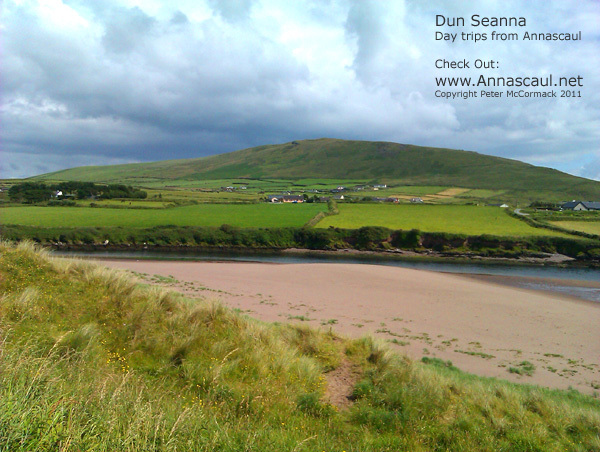 Dun Seanna Beach – Basecamp Annascaul Day Trips – Annascaul Village, Annascaul Accommodation, Tom Crean, Jerome Conor, Irish Horse Fair and more! 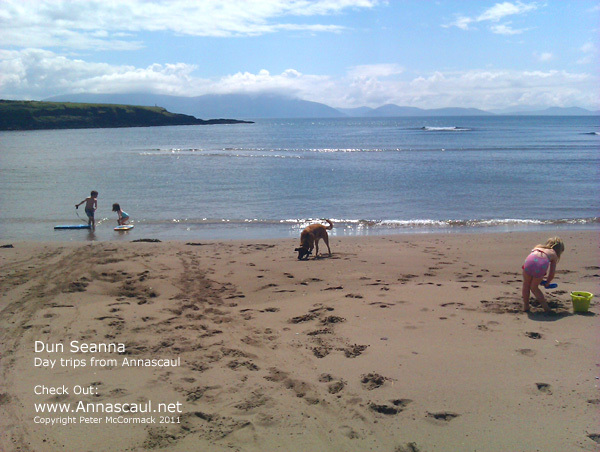 Dun Seanna Beach, Also know as Doonshean is perfect for a day trip for anyone staying in Annascaul. 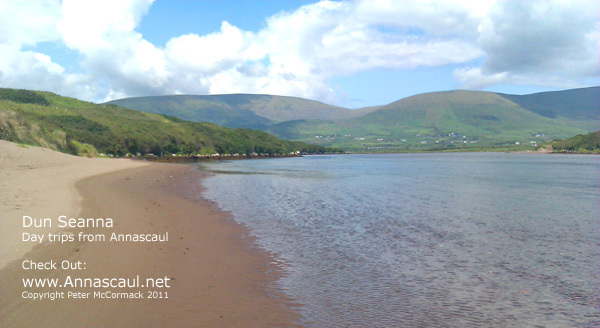 It’s about a 15 minute drive from the village, and just outside of Dingle town. Dun Seanna is one of those places on the Dingle Peninsula that does not get a huge amount of visitors because it’s a bit out of the way, and to be honest most people don’t know it’s even there. Recently, on probably the hotest day in July, we brought the kids and their cousins off to Dun Seanna. I counted about five people on the other side of the beach, near the rocks. There wasn’t another soul to be seen all day. This same day on Inch beach it was packed. So Dun Seanna is a quiet little retreat and as you’ll see from the photos in this post, it’s a beautiful spot. We had a picnic and the kids played with their body boards in the water, the sea was calm and mild and shallow enough for the kids to play in. The beach was absolutely spotless, as was the river. When the tide is out there’s lots of little pools for kids to paddle in. Note: I’ve been told that there is a strong riptide but if you keep right of the beach this will not be an issue. 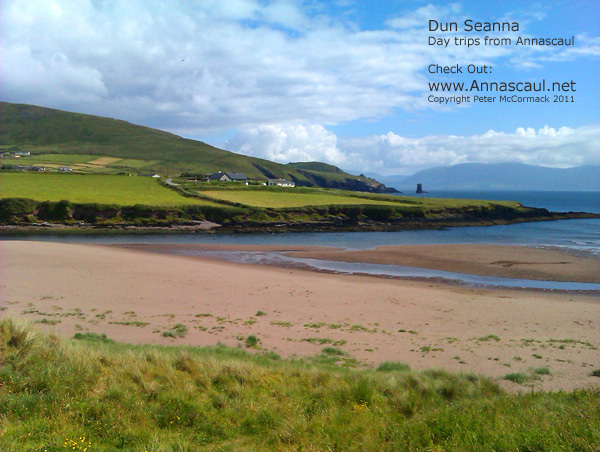 Coming from Annascaul side, you’re almost in Dingle when you’ll see a sign on the left side of the road of Dun Seanna. Take this left (its a bit of a sharp turn) and then take the next left. Follow the road for a few miles passing farm houses (and Camp Hill) until you come to fork in the road. Take the right exit here and this’ll bring you to the beach. This is one of the recommended day trips for people staying in Basecamp Annascaul. The reason we’re using this title is because Annascaul is so central to so many great attractions on the Dingle Peninsula. See more day trips you can take from Annascaul. This entry was posted on July 22, 2011 at 11:44 am. You can follow any responses to this entry through the RSS 2.0 feed. Both comments and pings are currently closed.